American Apparel California Fleece, the color options for Just Hoods’ College Hoodie—all these things became important details of my business—as a result, I have always been searching for the perfect hoody. I think I’ve finally found it. 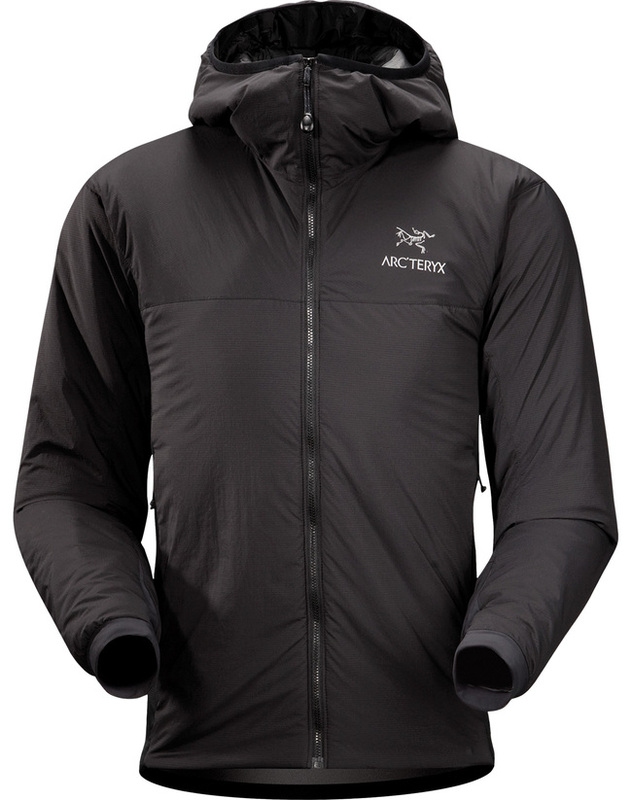 The Atom LT Hoody from Arc'teryx feels like a piece of clothing from the future. It weighs just 375 grams (13.2 oz) and is easily compressible for packing and travel. It’s waterproof, windproof, and a great insulator of body heat. Most importantly, it’s incredibly comfortable. If humans were to try and create mithril, I would want it to feel like this. Each material used to create this hoody has a job to do. The outer shell is extremely hydrophobic. After being in the rain, you can see the droplets coalesce and quiver on its surface; this means you can easily dry it by brushing the droplets off and then store it in your backpack alongside any electronics. The side panels that extend from the armpit to the base of the hoody use a different material. On the outside, there’s a flexible and breathable fabric and on the inside there’s a fleecy, fuzzy layer. It helps reduce the loss of body heat by wicking sweat away from the skin and out towards the surface. Once there, the moisture can spread out over a much larger surface area before evaporating; this makes it twice as effective as normal cotton. It’s compressed so that it is really trim but it still maintains nearly all of its insulation properties. 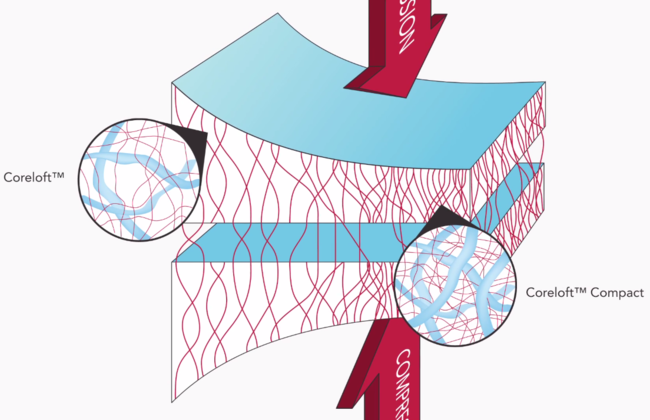 Polyester staple fibers of mixed sizes are compressed and crimped to trap air and retain warmth. These are cross-hatched with denser lines of fabric known as deniers that create the square pattern you can see when you look closely at the material on the inside. The end result is a magical material that’s soft, light, strong and insulating. In fact, the material is so thin you can squeeze the entire hoody into one if its arms for easy storage. The stretchiness of the material used on the hems that surround your wrists is just right. The sleeves cling to your skin as you move your arms but they don’t wrap too tightly. At the base of the hoody, the hem itself is made of a thicker, tougher material which is perfect for sliding your hands around to adjust the hoody after you zip it up. Zipped up with the hood up: It circles your face and chin neatly. Zipped up with the hood down: It sits around your neck comfortably. Unzipped with the hood up: It arcs nicely over the head. Unzipped with the hood down: It hangs evenly across the shoulders. The design of the hood and the choice of fabrics negate the need for drawstrings and I don’t think you’ll miss them whatsoever. That couldn’t be more true here. The team that designed this hoody clearly put a lot of thought into the use-cases and hand motions involved with every moving part of the hoody. 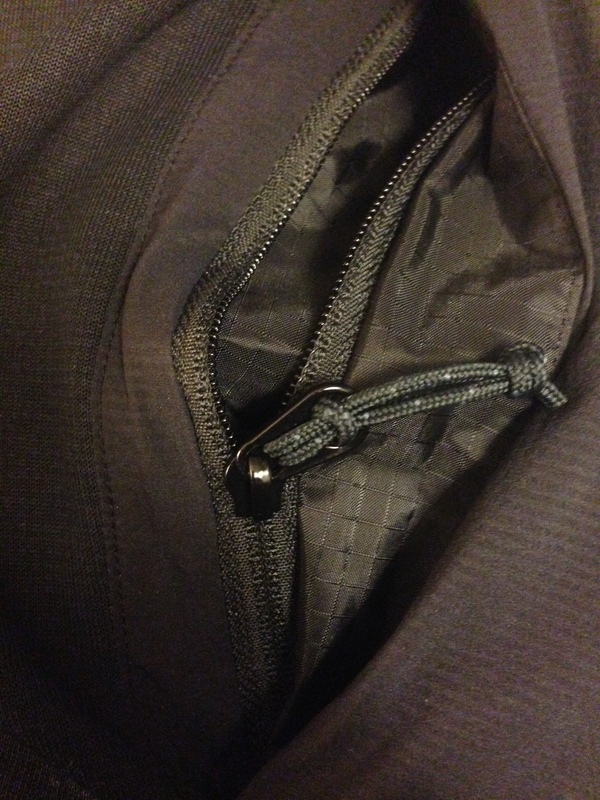 They’ve selected different combinations of zippers, sliders, cord locks, nylon thread, and elasticated rope for each section to make it really easy to use and simple to adjust. 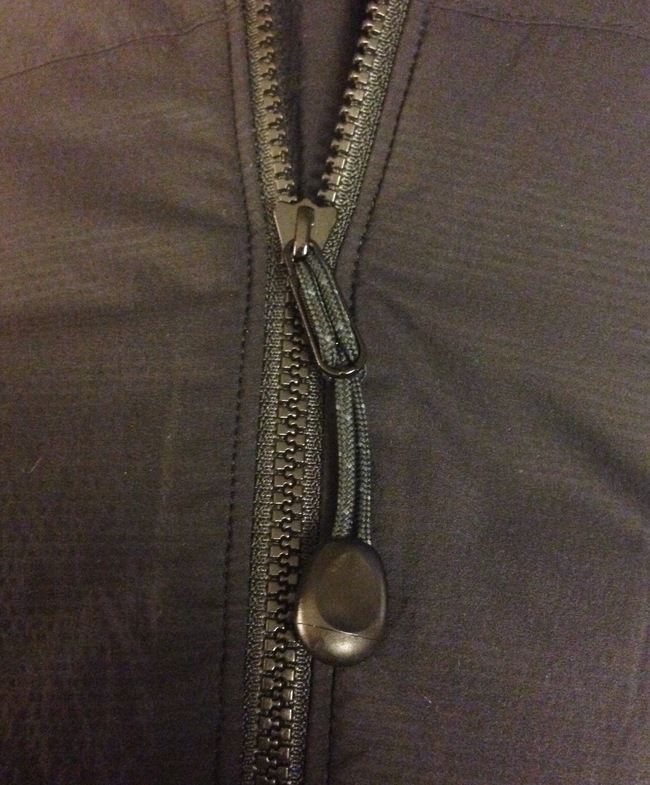 The front zip is the access point to the garment and allows you to set how snuggly or cool you want to feel. It’s important that you can reach the slider, grab it, and zip it in either direction quickly. This hoody has YKK Vislon 3VS Zipper with a DFL non-lock long pull slider that has a custom, plastic, teardrop-shaped tab attached to it with some high-quality 3mm nylon cord. The tab is easy to grab and hangs just below the right side of the hoody when its unzipped and below your chin when it’s zipped up. The outer hand pockets have zips which makes them a good place to store valuables when you’re snowboarding or if you take the hoody off. As far as I can tell, they’ve used YKK’s NATULON® Chemically Recycled Zipper with the CONCEAL® chain which prevents your wrists from chaffing against the teeth of the zip when they’re deep in the pockets. 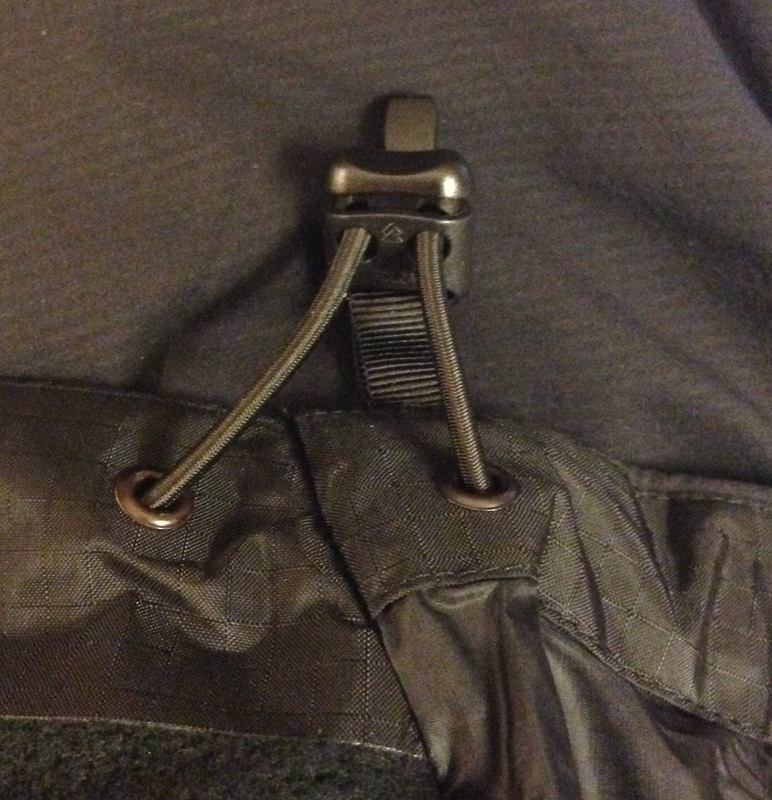 The slider is the DFBW non-lock, short pull for reverse; it’s got a some 3mm nylon threaded through it and tied off in a granny knot which makes it super-easy to open and close the pockets from any angle. The internal pocket is really handy and perfectly placed to store a wallet, lift pass, or ID. It uses a similar zip to the external pockets but it’s slightly scaled down and doesn’t have any nylon; when empty, it’s barely noticeable. Where it hangs around your waist, the hem encloses a stretchy cord which can be tightened using two plastic cord locks (one on each side) which look to be a custom design and each have the code FCLA2 etched onto them; some Googling returned a now-broken website for a manufacturer of these cord locks. These work perfectly and can tighten the hoody around your waste; I imagine this will be particularly useful when snowboarding in deep powder. The design is anatomically sensitive in a way that’s hard to describe until you put it on. All of these incredible materials are joined together with blind seams and barely-visible stitching to create one beautiful garment. It feels like the designers have taken into account every movement you’re likely make. Whether you’re running, reaching up to a high shelf, or twisting in a car seat, the silky and stretchy sections all seem to glide and expand around your body as if it was a second skin. The outer pockets are perfectly positioned so that when your hands are deep inside them your elbows are bent at a comfortable angle and your arms can rest. It’s not too baggy and it’s not too tight—it just fits—most hoodies bulge at the sides and overhang at the base. With this hoody, the hem at the base tapers up from the back and rests just below the belt-line on the front when it’s zipped up; when its unzipped, it hangs neatly around your sides. Arc'teryx is shorthand for archaeopteryx lithographica, which was the first reptile with the feathers that allowed it to fly. Their logo, which I love, is based on the fossilized skeletons of this ancient species. It’s applied to the hoody’s fabric with a thick reflective ink that glows when you shine a light on it. This hoody is a truly great product. It’s a combination of incredible advances in materials science, obsessive attention-to-detail, and fantastic product design. One of its greatest qualities is its versatility. It’s light and durable for traveling; it’s warm and waterproof for snowboarding; it’s clean-cut and fashionable for nights out. I can finally stop my search. My thanks to Adam Fraser, Alex Barton, Alex MacCaw & Tim O'Shea for reading drafts of this.